Yesterday, I spent the afternoon sitting in the cancer ward waiting to hear my name called. I have been experiencing some pain in my right breast and felt some places that didn’t seem right to me. So I went to the hospital to see my OBGYN. I waited and waited and was finally seen. The midwife first examined me and I told her of my family history. Since my mother died of breast cancer at the age of 44, she felt that the Dr. should also come in. I explained that I was still breastfeeding and wasn’t sure if it was related to that or not. The Dr. was very thorough and checked both of my breasts. But then said that he would like to send me over to the oncologist for a better examination. They asked if I had ever had a mammogram and I said that I hadn’t, so they called over to the oncology ward and gave an introduction for me. I felt pretty confident that it wasn’t cancer but still, having your doctor tell you to go to the cancer ward is a bit disconcerting. I walked down the hall and registered with the oncology department with the help of a very kind nurse. She had no idea whether I had cancer or not but she saw me as a mother with a young child and treated me with the utmost kindness. I felt my heart beating a little faster than usual and I worried as Violet heard the doctors talking about where I was going. She understands more Japanese than I do. And she heard them telling me that i was going to be checked by a different doctor, she wanted to know exactly where we were going. She knows about cancer because of all the family members we have lost to this disease. I didn’t want to lie to her but also didn’t want to cause her undo worry. So I just told her we were going to get my milky looked at by another doctor who would look at a picture of the inside of it. She was satisfied with that. We sat there waiting and I couldn’t help but notice how the lights were darker in this ward than in the OBGYN ward. It was quiet and most of the patients that we saw waiting there were hunched over and seemed to be in a certain amount of pain. Some were young and some were obviously in there late 70’s or 80’s. The ones who made eye contact with me gave me sympathetic smiles and I could tell they were wondering how I was and what I was there for. Violet’s smiles and energy definitely seemed to lift their spirits too. I figured that I was going to get a mammogram but was hoping they would let me have an ultrasound instead as I was concerned about radiating my breast milk. Just in case though. I told Violet that she might not be able to drink milkies after my exam for a bit. She looked worried and said she would like to drink some before we went in. A woman in her mid 70’s walked up and said “おいしそう“, which means, looks delicious. She went on to say how rare it was to see a girl her age drinking breastmilk and how wonderful it was. I felt encouraged and continued to smile down and my sweet girl. Sitting there, waiting with her in the cancer wing filled me with so many memories. My mother was everything to me. She was my first friend, she was my confidant she was my hero. When she was diagnosed with breast cancer, I wasn’t there. I was away at college and had to hear about it over the phone. How I wish I could’ve been sitting there holding her hand instead. I was able to sit with her through some of her treatments and drove her to some of her appointments during spring and summer vacations. We would sit there holding hands and trying to make each other smile or laugh. I was scared and she was scared. She was brave, she was selfless and showed me how to endure the impossible. Losing her was the hardest thing I have ever experienced and I pray that Violet is spared from watching me die from a disease that ravishes the body. Today, I am thankful for the excellent health care I have experienced here in Japan. Today, I am thankful for my healthy breasts. Today, I am thankful for today! This PSA is so powerful and never fails to make me cry. I ask you all to remember to “touch yourself”. For your self, for your husband, for your children, for your friends. Set a date and check yourself every month. It’s easy, it’s free and it’s painless. As of April 1st 2014 I have become a stay-at-home mom again! I couldn’t be more thrilled with my new daily routine. It has been a joy to wake up knowing that I get to spend the whole day with our precious daughter. We have been enjoying taking long walks and having nature scavenger hunts, reading till we can’t read anymore, singing, playing the piano, painting and dancing. It is what I always longed to do. Having said all that, I have recently gotten out of the swing of writing on my blogs. So in order to get back into the groove I have decided to try a couple of things to get me started again. Wednesdays will be “Wordless Wednesdays”, where I will try to post a photo or an inspiring image I have found. Thursdays will be “Thoughtful Thursdays”. I will try to share an inspirational quote or verse. When I was a teenager, I had an Aunt who was breastfeeding her first daughter. My aunt has always been a very strong, independent woman and she came across to me as a very confident breast-feeder. She would feed my cousin whenever she was hungry. No matter where we were. She was the first of my 8 aunts that I ever saw feeding outside of the back room at my grandmother’s house. She always had on clothing that provided easy access for nursing and she laughed when my little cousin would call out “teta mama teta!”. Her eyes sparkled when she laughed and smiled down at her growing baby. I remember one particular occasion when the whole family was taken aback by her nursing in public. We were at my oldest cousin’s wedding. My brothers and I were singing at the altar when we looked out at the pews to see my aunt opening up her blouse and exposing her breast so that her baby could drink. My youngest brother gasped and we all tried to hold in our giggles. After the wedding was over my other relatives and my grandmother lovingly teased her about showing so much of her skin and all wondered how she could dare breastfeed during a wedding and in a church pew for that matter. It became a family inside joke that everyone had seen Aunt ***’s breasts. She never seemed to mind and laughed along with everyone else. My Aunt also breastfeed her children longer than any of my other aunts. Her oldest nursed until the age of three. Everyone nagged her about weaning and even I joined in on the teasing. Me, a childless teenager, teasing my aunt about breastfeeding. I can’t even imagine doing something like that now. She took it all in stride though. At least that is what I gathered from the outside…. Now here I am still breastfeeding my 4 1/2 year old daughter and the shoe is on the other foot. I get occasional questions from family members about when I am going to wean. But the fact that I live across the ocean and only see my family for about 2 weeks out of a year probably has something to do with that. I think I am the most blatant public nurser in my family. And when I nursed her in the pews of both my grandparents funerals last summer, they all turned a blind eye. I truly believe that although I didn’t know it at the time, watching my aunt nurse with such confidence helped mold me into the mother I am today. The memories I have of being around her while she breastfed her children gives me courage and strength and help me to feel like what I am doing is normal and natural. So, although I am not going to mention her name, I know she will know this is about her when she reads it and I want to tell her thank you. Thank you, dear aunt, for being brave and fearless. Thank you for being strong and confident and for showing me how beautiful this experience truly is. I love you. Thank you to all the mothers out there that nourish their children in the company of others. You may not know it, but you are paving the way for so many other mothers. You have the ability to change the way breastfeeding is perceived. You can make a difference in the lives of those around you. Thank you, thank you, thank you. It recently came to my attention that I might be propagating an image that is not entirely true to life. I am not trying to be dishonest about my family life or the way I raise my child. If I don’t mention any of the unpleasant stuff, it is not in an effort to look more perfect but to spread around the good stuff rather than the bad. But to clear the air I just want to open up a little bit about what does go on in my home. My daughter is not happy all the time. I don’t know anyone who is and I don’t think that would be healthy. We do disagree and she does yell at me and hit me sometimes in anger. She has temper tantrums and demands my attention. I don’t believe her actions to be out of the ordinary for a 4 year old child. I try to handle these unpleasant moments with as much patience as I can. I have never yelled at my daughter. I have never hit my daughter. I have lost my patience and sighed in exasperation. When she was 2 we did try time outs a couple of times and I abhorred those moments. I had read a book that suggested you gently tell them they can come out when they are ready to be kind and to not let them come out. We did that one time. It was torture and I regretted it the moment it started. I have no idea how that time out might have scarred her and I don’t know what terror she felt by being isolated. It haunts me to this day. When she is misbehaving we do time ins. We sit together and talk about it or don’t talk about it. The point is, I believe that when she is misbehaving it is because some legitimate need is not being met. I try to figure out what that is and we try to fix it together. Another thing that is missing from this blog is the presence of Violet’s father. She does have a father and he does live in our house. I don’t often write about him because this blog is mainly a blog about mothering. I do write about her father and our family life on our family blog. What an analogy! She takes my breath away sometimes. It reminded me of the day of the tsunami, when I thought my husband might be dead. And when he walked in the doors and we embraced it was as if time stood still. All of the arguing and disagreements we had been having melted away. We were so thankful to be together and to have each other again. We felt so weak and yet so strong. When you feel you have escaped death you look at life differently. I wish that I could say that feeling lasted forever for us. It didn’t. Three years later and here we are taking each other for granted again. A life lesson gone to waste. But I don’t think it is too late, I think we can get back that zeal for life, that appreciation for each moment, each breath. I wish that I could tell you that after she said that to us that my actions changed. I continued to feel anger toward him but I did try to get along with him for the rest of the day. Our parenting style has challenged our marriage in ways that I didn’t expect. I don’t think it is fair to say that all of the difficulty we are having stems from our parenting style, because I think we have other underlying issues as well. I also don’t want to give attachment parenting a bad name. I think it is wonderful and I wouldn’t do it any other way. And there are plenty of families that practice attachment/gentle parenting that have happy marriages. I do hope that my husband and I can continue working on our relationship and that we can figure out a way to not argue so much. I don’t like that my daughter has had to witness our arguing and I hope that we can model healthy behaviors for her. I want her to know that marriage is hard but also that making the effort to work on it is worth it. There is nothing wrong with disagreeing with each other, but we should find a way to disagree in a healthy way. I also think that if she is going to see us argue, then she should definitely see us make up. So, although it is embarrassing to admit that my life isn’t the perfect model of a happy family, I felt it important to clear the air and remove any veil that might be creating a cloudy image of the reality of my life. Please don’t judge me too harshly nor my child’s life. I only wanted to try sharing a glimpse into my life without the rose colored glasses. With social media being so pervasive to our lives, I / we often have these false ideas about what other people’s lives are like. I don’t believe that your child is always perfectly dressed or that your husband always brings you flowers or that you all get along happily all the time. But when I / we only share these happy moments it does propagate an image of perfection that no one can attain. It can, unintentionally, create jealousy and envy of a life that doesn’t really exist. In real life, we don’t have this constant stream of information about each other. When we meet or talk on the phone, we exchange stories and experiences of recent and there is almost always a mix of pleasant and unpleasant moments. We share because we long to connect with someone who will listen and understand us. I wouldn’t normally tell just anyone about my marital troubles or my failings and mistakes as a parent, out of pride mostly. But I would and do share them with my closest friends. But since for some of you, reading this blog or my Facebook statuses is the only way you “know” me ,I thought it unfair to only share the positives about my life. So in an effort to be more open, I am sharing these details of my life. If I / we are going to continue living with social media (which I believe we are) I think it is important that I/we try to be more honest. Thanks for reading today. I wish you and yours a peace filled day. When Violet was born, I had no idea how long I would breastfeed her. I only knew that I would breastfeed her. By the time she was 1 year old, I knew she wasn’t near being ready to stop and so I decided to just keep going. I know that I am not the only one practicing full term breastfeeding, but at times, I do feel like the odd ball in the group of nursing mamas. When I attended the Big Latch last year, I was, by far the one with the oldest nursling. Part of me felt slightly concerned with what the other mamas might be thinking, but most of me felt proud and accomplished. If those of us that do continue to nurse our older babies and preschoolers can’t talk about it with others or always feel we have to do it behind closed doors, we might start to feel strange or even embarrassed. I write this post to share with you all in hopes that it will encourage other full term breastfeeders to do the same. You are not alone and there are others out there like you. I hope that by reading this it will encourage you to not give in to the pressures of friends, family or those around you to wean before it feels right for you and your nursling. I am trusting my heart and my own judgment to know when it is best for my child to wean and I hope that you can trust yourself as well. According to Katherine A. Dettwyler, Ph.D.,an award winning anthropologist, professor, and mother, the natural age of weaning for modern humans based on our size, development and life span is between 2.5 years and 7 years. Therefore, a child still nursing at 4 years old is normal, natural, and o.k. I am planning to continue breastfeeding Violet for as long as she would like to continue. I have been practicing baby/child led weaning since Violet was about 2 months old. From the moment she was born, I practiced on demand feeding. If she cried I usually checked her diaper and if it was clean, I put her to my breast. She has always been an active nurser. She went from every hour in the first 2 months to every 2 hours and gradually to where we are today. Violet wakes up slowly by nursing herself awake. Her body wakes up first and before she has even opened her eyes she reaches for my breast. Since she sleeps right next to me all she has to do is reach up and nuzzle in. She nurses there for anywhere between 5-20 minutes. I usually wake up as she first begins to wiggle and so I am awake while she is nursing. I stroke her hair and kiss the top of her head. If it is still very early I whisper into her ear that she can go back to sleep. If it is close to the time I need to get up, I start whispering good morning and gently massaging her back and legs to wake her up. I sing to her, softly, “Good morning to you” (to the tune of happy birthday” She smiles sweetly as she gradually opens her eyes. Some days she sits right up and says “good morning, mama!” and other days she puts her hand up on my chest as if to say let’s stay in bed a little longer. Eventually she wakes up and stops nursing. And then we get up for our day. Violet goes to school Monday through Friday from 8-3. On those days she doesn’t usually nurse again until 5 or 6 pm. Sometimes, though, she wants to nurse as soon as we get in the car after picking her up. Since she turned 4, I’ll admit that I have become a little more apprehensive about nursing her in public. I don’t feel like I am doing anything wrong but some days I just don’t feel like enduring the looks or questions. I try to practice “don’t offer/don’t refuse” as much as possible, but sometimes I do tell her we need to wait until we get home. She is capable of understanding the need to wait for something and this is a way we practice having patience and consideration for mama’s feelings. She doesn’t always wait patiently and she sometimes cries and gets angry because I have said no but we try our best to work through it. Thankfully, our drive from her school to our house only takes 5 minutes. I know that she is yearning for that connection for “skinship” as is it called here in Japan, skin to skin contact, and so I understand where her anger is coming from. When we get home, as soon as we walk in the door, she takes off her shoes and takes me by the hand and says “Mama it’s time for milkies”. We head to the couch and she hops up on my lap. As I get my clothes situated, she smiles up at me and giggles. Then, at last, she dives into my chest and wraps her arms around my chest and pulls me as close as she can. She drinks there and looks up at me with eyes of contentment and relief. I can feel her body relax and I feel mine relax as well. There is a word in Japanese that describes this feeling that I think we both have during this time, it is あんしん,安心(anshin). Anshin translates to relief or peace of mind, obtaining peace of mind through faith or ascetic practice. It is so much more than that though. To really grasp the meaning one needs to look at the etymology of the word. The characters that make up anshin are these 安,which means relax, quiet, rested, contented, peaceful and 心, which means heart, mind, sprit. I actually feel that my entire being relaxes and her whole being relaxes too. My heart feels peace after a day of adult worries and stresses and her heart releases any worries that have built up in her mind during our day apart. It is a time we can unite and really be present to one another. After that we play a bit and then I am off to make dinner. She doesn’t usually nurse during dinner anymore (unless she isn’t feeling well) and so we finish our meal and transition into our bedtime routine. She has a bath with daddy, usually, and then we either watch a short program on our computer or we just play and read together as a family. We head up to the bed with our books for the night and situate ourselves in our family bed. She is usually playful and shouts out “I’m gonna get those milkies!” as I try to arrange the blankets. When we finally lay down she settles in once again for her last nursing session of the day. I read to her as she nurses off and on and she sometimes falls right asleep during the 2nd or 3rd book. Other times, we finish the 3rd book and then I turn off the light and sing her lullabies as she nurses herself to sleep. There have been a handful of nights when she has fallen asleep while snuggled up instead of nursing herself to sleep, but for the most part, she still falls asleep at my breast. She rarely awakens during the night anymore, but if she does, she whispers up to me “mama, may I have some milkies, please?” Then she nurses herself right back to sleep. And then we start our day over again. Nursing a four year old is not something that I set out to do in the beginning but it is where we are today. I am fully confident that one day she will wean herself. I know that one day she will just not want to or need to do it anymore. And when that day comes, I hope that she will know that I am still here for her when she needs me. My arms will always be wide enough to hold her, my lips will always be ready to talk or offer a comforting kiss, my ears will always be ready to listen, my lap will always have a spot for her to rest on and my heart will never run out of love for her. She often tells me that when she is all grown up and I am an old lady that has grown small again, she will hold me and rock me and give me her milkies. To her, I believe, this is the ultimate expression of love, to nourish and comfort someone at the breast. I am honored and overwhelmed by love that she imagines doing this for me one day. So, here we are 4 years and 4 months old and still nursing, still co-sleeping, still living this life the way we feel we should be. Still feeling anshin. Are you still breastfeeding an older baby or child? Have you felt pressured to stop or overly criticized? I hope that you felt encouraged by today’s post. If you feel like sharing your story, do so in the comments below. I want to begin by thanking you all, dear readers, for your support and well wishes for the release of my book. The response to it has been humbling, to say the least. I promise that this blog is not going to turn into constant advertising for the book but I did want to mention these special upcoming dates. 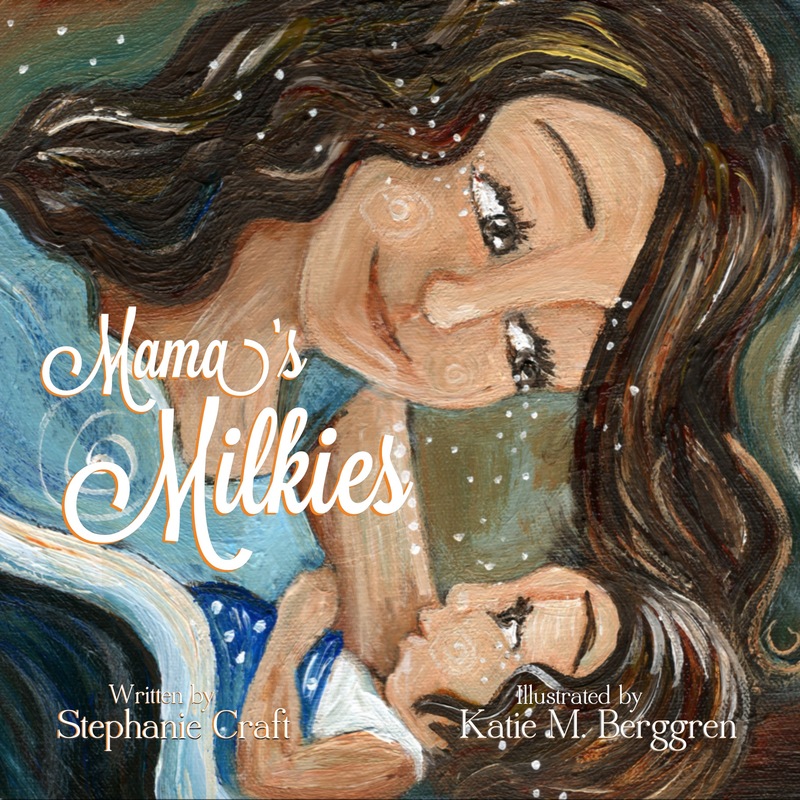 The artist, Katie m. Berggren, will be holding a Virtual Art Opening of the original paintings from the book Mama’s Milkies. The original paintings are on 10×10 inch canvases and can be purchased for $240/each. Each painting also comes with a free copy of the book. They are also available as prints for $19/each. I am very much looking forward to seeing the opening. Thank you, Katie, for sharing your amazing talents with us all. I have been anxiously waiting to share with you all some very exciting news! I have written and published my first children’s book! 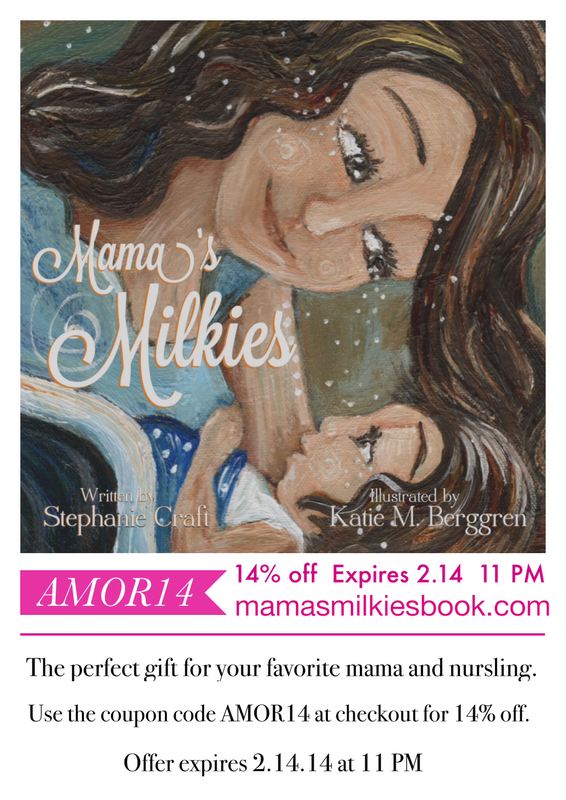 Mama’s Milkies is a children’s book about a full term breastfeeding child. The reader will follow the little toddler through the day as they wake and play, read, sing and finally drift off to sleep. All the while knowing that mommy still has “Milkies” when they feel like nursing. I am so thankful that I had the opportunity to work with the very talented Katie m. Berggren on this project. She has illustrated the book with such careful thought and close attention to detail. She brought so much warmth and light to the text and I treasure each piece as a work on its own and as a part of the full project. I wrote the text to this book when Violet was about 15 months old. We were lying in our bed nursing one morning and the words just started flowing out. Thankfully, I had saved the poem on my Ipod, as our computer was lost in the tsunami. I always dreamed of turning it into a book but wasn’t sure how to go about it. With the helpful advice of Katherine Havener, author of Nursies When the Sun Shines, and the support of my husband, I decided to go the self publishing route. As a breastfeeding, co-sleeping family, we often look for books that portray our life style to read to Violet. There just aren’t enough books on the market about breastfeeding babies and only one that I could find about a breastfeeding toddler. So I thought, why not make one myself. I hope that the lyrical text and Katie’s gorgeous illustrations find their way into your hearts and that you will enjoy reading it with your child. Whether they are still breastfeeding or not I hope that you find it brings a smile to your face and snuggles to your arms. I now present to you Mama’s Milkies. Other exciting news is that each individual piece of art will be available for purchase through Katie M. Berggren! Stay posted for information on her Virtual Art Opening.